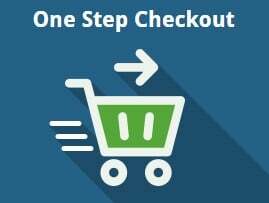 Today, we explore a Magento 2 one step checkout extension. We have already reviewed several similar tools, such as One Step Checkout by Magestore, and have a small digest of OSC Magento 2 modules. Since Amasty released own solution, we think itis necessary to describe it shedding light on the extension’s functionality and features. 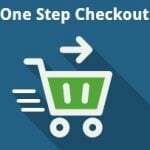 To make the default Magento 2 checkout more attractive, the Magento 2 one step checkout extension by Amasty combines all checkout steps on a single page. It essentially speeds up the whole shopping process and increases chances your potential buyers complete the checkout. Furthermore, Amasty OSC fully leverages Google Suggestions, so address fields can be filled in instantly, making the improved procedure even more user-friendly. Another significant customer-oriented improvement is related to the ability to edit products right at the checkout. 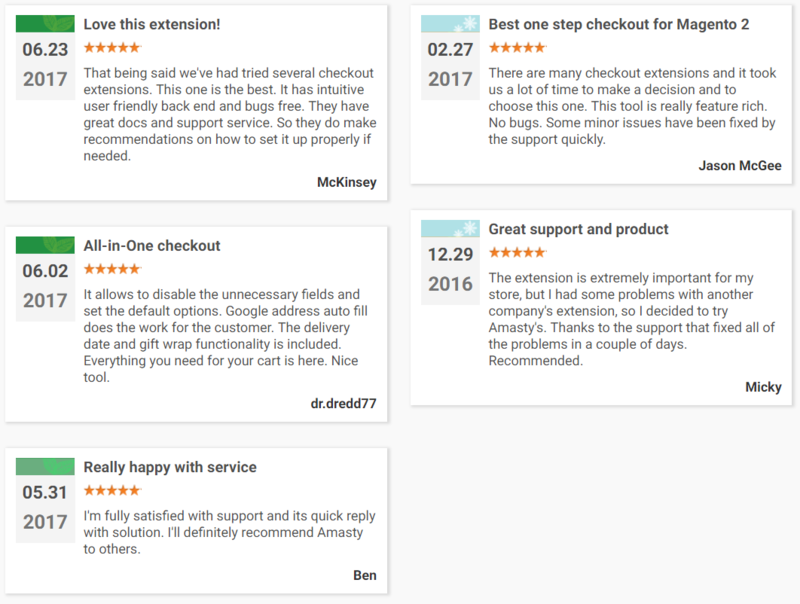 This is how the Amasty One Step Checkout Magento 2 extension makes Magento 2 better, but let’s discover more details and nuances. First of all, we’d like to concentrate on admin-oriented features. The backend section of the Amasty OSC module not only consists of an intuitive and easy to use interface, but also provides some essential functionality. First of all, it offers two different checkout page layouts. Thus, you can easily select either 2 or 3-column design. 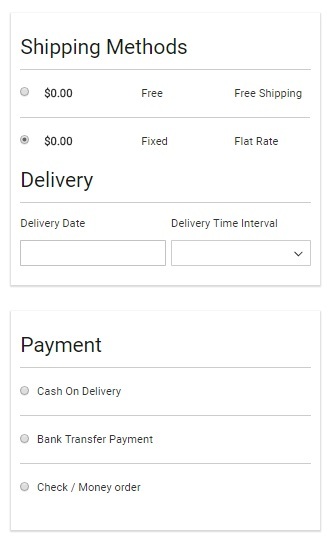 Furthermore, you can choose different fonts or colors for such elements like checkout background, order summary block, heading text, and the “Place Order” button. The module also supports LESS and CSS styles for even more flexible theme customization. Note that Amasty allows you to add a custom title and create a description as well. Moreover, admin users can change titles of the blocks on the checkout page. 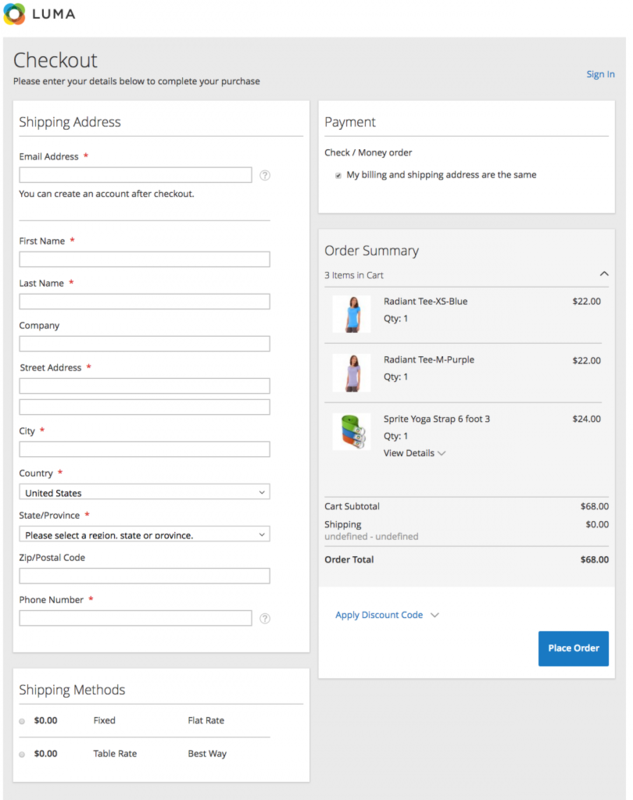 When your checkout design is ready, you can proceed with more advanced customizations. The Magento 2 one step checkout extension provides the ability to disable unnecessary fields. Thus, you can make the checkout procedure as short as possible. Furthermore, it is possible to specify detailed values for specific fields. For instance, if you have customers from a single country only, you can preselect it in the settings. The same trick is possible for the city and zip code fields. Payment and shipping methods can be preselected as well. Besides, the Magento 2 one step checkout extension by Amasty provides the ability to customize the checkout success page. You can place CMS blocks there promoting more items, services, or offers. As a result, the tool can be fully leveraged for increasing the number of repeated purchases. As for customer-oriented features, Amasty also offers top-notch functionality. The mentioned Google Auto Suggest allows your clients to speed up the checkout procedure with the help of smart suggestions. A drop-down with possible address variants is displayed every time a customer starts typing. Besides, there is the GEO IP tool that provides automatic location detection. 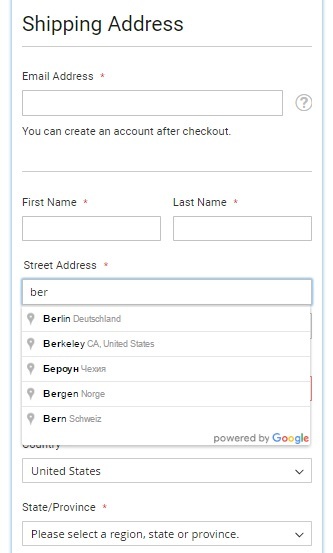 As a result, the Country checkout field can be filled automatically. Note that both configurable and custom products can be edited right on the checkout page. A customer can easily select a new color, size, or other attributes without returning to product pages. Moreover, to bring shopping experience to an entirely new level, Amasty provides your clients with the ability to specify a custom delivery interval. Besides, it lets customers purchase a gift wrap and add a gift message. Now, when you are familiar with the core features of the Magento 2 one step checkout extension, let’s see it in action. The backend settings of the Magento 2 one step checkout module are divided into 2 tabs: Geo Ip Data and One Step Checkout. The first one is necessary to make the geolocation feature work. 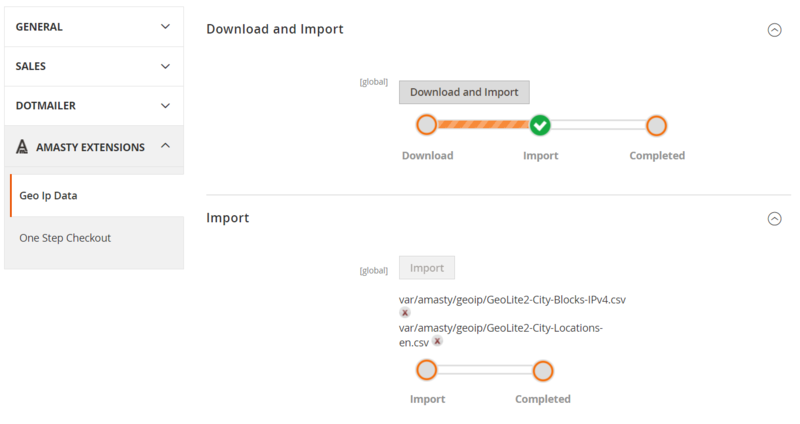 You can download and import a CSV file with Geo IP data right in settings. As for the One Step Checkout tab, it is divided into 10 sections: General, Geolocation, Default Values, Block Names, Design Settings, Additional Options, Gifts, Delivery Date, Success Page, and Top and Bottom Custom Blocks. 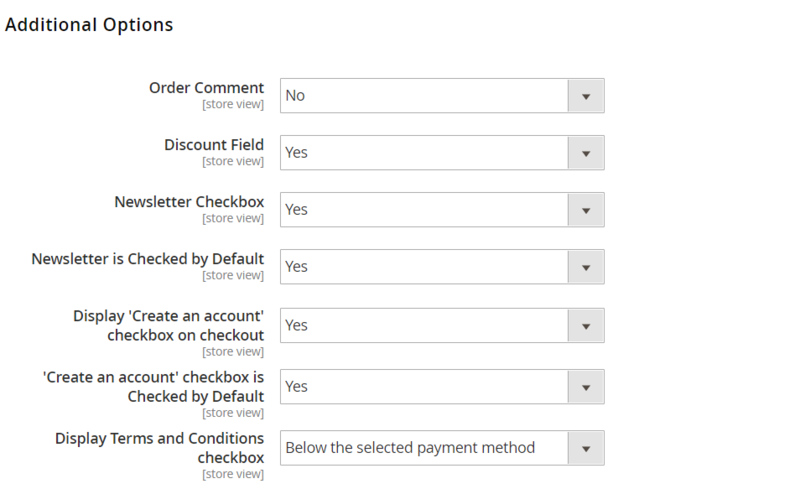 The General section of the Magento 2 one step checkout extension allows you to enable/disable the module, create custom checkout page title and description, and edit products in the Order Summary. It also provides the possibility to reload shipping methods if a coupon code is applied and refresh payment methods and grand total if a shipping address is changed. In Geolocation, you can enable/disable Geo IP Location and Google Address Suggestion features as well as add Google API Key. 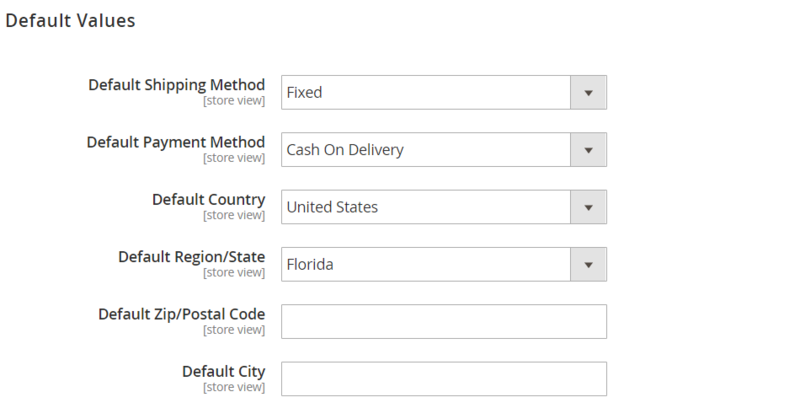 The Default Values section allows you to select default values for such fields as Default Shipping Methods, Default Payment Methods, Default Country, and Default Region/State. Besides, you can specify values for Default Zip/Postal Code and Default City. 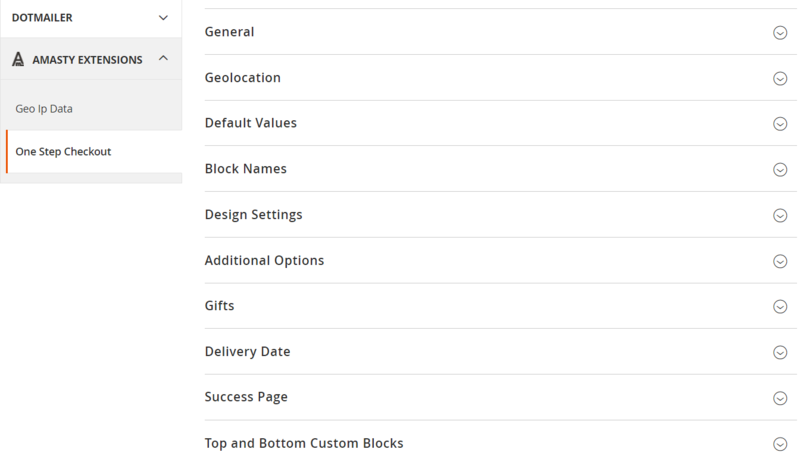 In Block Names, you can change the default titles of the following blocks at the checkout: Shipping Address, Shipping Method, Delivery, Payment Method, and Order Summary. 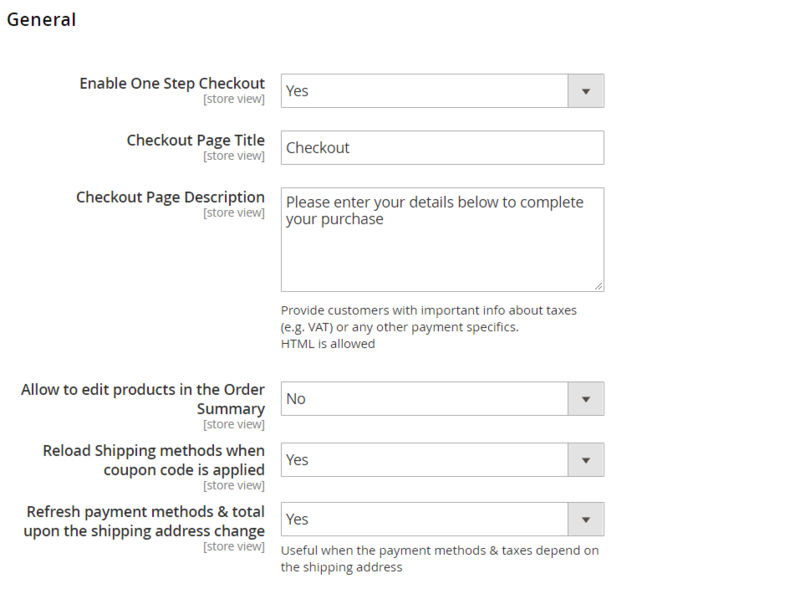 Design Settings of the Magento 2 one step checkout extension is a place where you enable/disable header and footer blocks, select a checkout page layout (2 or 3 columns), specify text font (enter its Google Font name), and choose colors for heading text, order summary background, Place Order button, and checkout background. The Gifts section of the Magento 2 one step checkout extension provides the ability to allow gift messages on order level and for order items. Besides, you can enable the Gift Wrap option and set its fee. In Delivery Date, the Amasty One Step Checkout Magento 2 extension allows you to activate the Delivery Date feature, make it mandatory, and specify its parameters: Available Days and Available Hours. 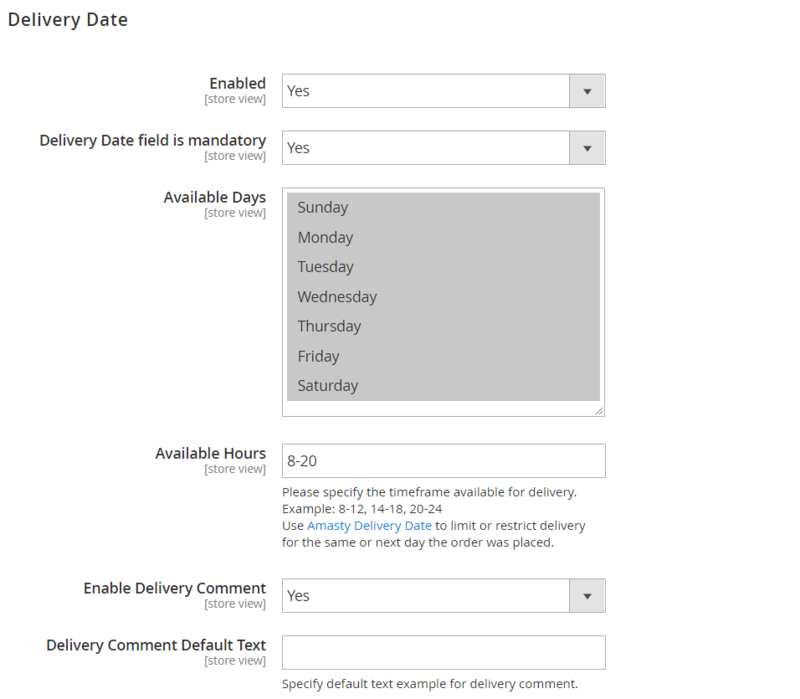 Here you can also let your storefront users leave delivery comments and create default text for the comment field. As for the Success Page of the Magento 2 one step checkout extension by Amasty, you only need to specify the ID number of a custom CMS block that should be displayed on the frontend. Note that it is necessary to create the block separately under Content -> Elements -> Blocks. In the last section of the extension’s configuration, you can select blocks that will be displayed at the top and bottom of the checkout page. 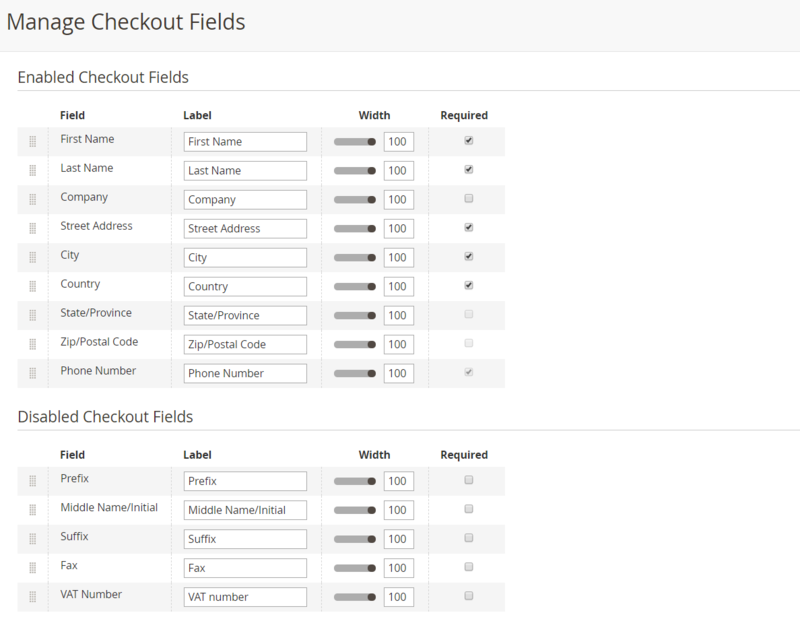 The Magento 2 OSC tool also allows admin users to manage the display of checkout fields. You can change the order of the fields using drag-and-drop, make specific fields required, and disable not necessary fields. Let’s see how each checkout section of this Magento 2 one step checkout module works. In the example below, the first one is the Shipping Address. It contains only 10 fields, 8 of them are mandatory, and 1 has a predefined value. It is also possible to increase the number of predefined fields. You can also see how the Google Autosuggest feature works in the Street Address field. In Shipping Methods, there are two radio buttons (one is preselected), but their quantity depends on the number of shipping methods you provide. Besides, there are two fields where a customer can select a delivery date and time. 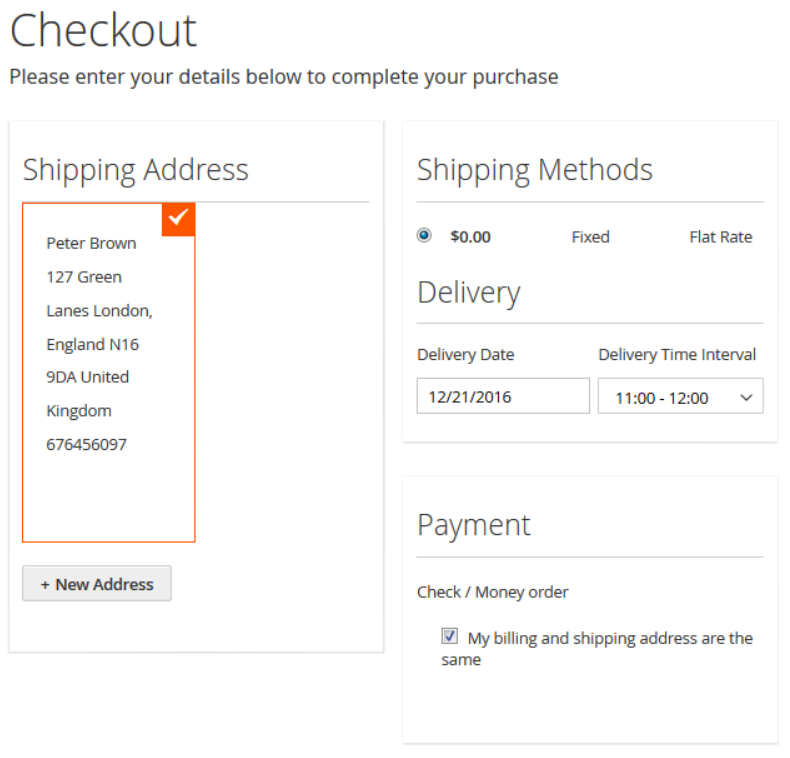 In Payment Methods of the Magento 2 one step checkout extension, all available payment methods are displayed. Right after a store visitor chooses a method, a new option appears – “My billing and shipping address are the same”. If addresses are not the same, they should specify the billing data right below the selected payment method. 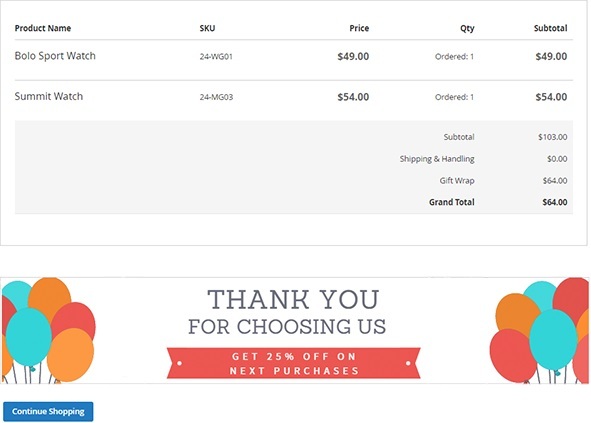 In Order Summary, the Magento 2 one step checkout extension allows viewing a product name, price, and thumbnail. It is possible to change product quantity here. Hit View Details, and you will get the ability to select a new color and size. Unfortunately, if you want to buy several items of the same product, it is not possible to pick a new color and size for each item separately. Besides, the Order Summary section displays Cart Subtotal, Shipping, and Order Total. You can also add a gift message, sign up for the newsletter, purchase a gift wrap, place order comments, and apply a discount code. Everything works great and is updated rapidly without page reloads. Compatibility with custom themes without LESS functionality was implemented. The information section was added to the Configuration page. Now it is possible to change the position of the Terms and Conditions checkbox: it can be placed below the “Order Review” section or with the payment methods. Now the checkout fields that are required by default in the standard Magento configuration can’t be changed to optional. Now the data entered at the checkout is not reset after the page reload. Now customers can leave comments in the Delivery section. Possibility to place CMS blocks at the top or bottom of the checkout page was added. Possibility to create custom titles for the blocks at the checkout was added. Compatibility with Amasty Gift Card was introduced. Compatibility with Amasty Custom Stock Status was introduced. Compatibility with Amasty Reward Points was implemented: now reward points can be applied right at the checkout. New: Amazon Pay support was implemented. New: now the newsletter checkbox “Sign up for a newsletter” is not shown to already subscribed customers. A new option: the “Create an account” checkbox was added to the checkout page. Thus, if this option is selected, the registration email is sent after an order is placed. 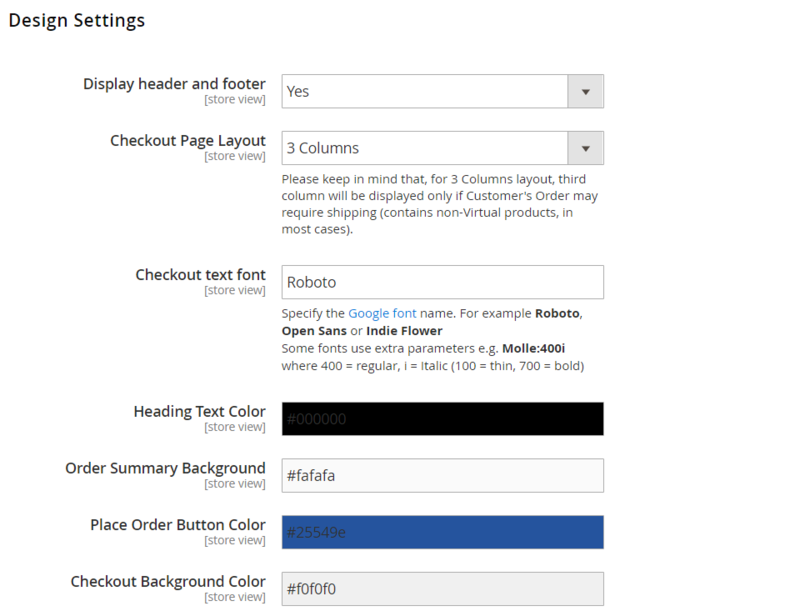 A new feature was added: now it is possible to configure the display of the header and the footer on the checkout page. Now an order comment can be attached to the order confirmation email. The ability to refresh payment methods & total upon the shipping address change was added. The ability to set an optional Zip Code for specific countries was created. The Amasty One Step Checkout Magento 2 extension is a reliable and easy to use OSC solution. It dramatically improves the default checkout experience providing both admins and customers with the most friendly way to interact with the checkout. As for the price, the Magento 2 one step checkout module costs $249.